The University of Louisiana at Lafayette’s College of Sciences was named Friday in honor of the university’s longtime president, who will retire in June. Effective at the university’s commencement on May 24, it will become the Ray P. Authement College of Sciences. The Board of Supervisors of the University of Louisiana System unanimously approved the change at its regular monthly meeting in Baton Rouge. Authement is the longest serving president of a public university in the United States. He became president of UL Lafayette (then known as the University of Southwestern Louisiana) on June 30, 1974, after serving a year as its acting president. He succeeded the school’s fourth president, Dr. Clyde Rougeou. “Naming the College of Sciences was proposed by Julie Simon-Dronet, UL Lafayette’s director of Public Relations and News Services, who is leading retirement recognition of Authement. 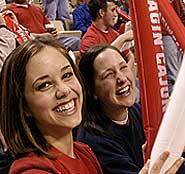 We thought it was an excellent idea,” said Dr. Steve Landry, UL Lafayette’s vice president of Academic Affairs. Landry and Winfred Sibille, vice president of the Board of Supervisors of the University of Louisiana System, then made a formal request for the name in a letter to Dr. Sally Clausen, president of the University of Louisiana System. “ We believe that Dr. Authement is very deserving of having the College of Sciences named in his honor,” they stated in the letter. They noted that through his vision and commitment to long-term goals, Authement led the College of Sciences to national prominence in areas such as computer science and mathematics. The college offers eight bachelors degrees, five master’s degrees and four doctoral degrees. In Fall 2007, it had 1,706 students and 315 graduate students. There are about 135 faculty members in the College of Sciences. Many of them have helped create academic and research programs that have earned national recognition. “Research in this college is relevant, is having an impact on the future of technology and attracts large amounts of external funds that stimulate our local economy,” Landry said. The college’s departments include biology, computer science, chemistry, geology, health information management, mathematics, physics and renewable resources. The Department of Military Science also reports to the college. Clark said the president also supported faculty, citing merit-based pay raises for the past 15 consecutive years, the creation of hundreds of endowed professorships and endowed chairs, and the presentation of awards for outstanding academic advising. The National Science Foundation recently ranked UL Lafayette’s computer science program in the top 60 in the nation and its mathematics program in the top 100. After the board voted unanimously to approve the college’s name, Authement received a standing ovation. “It has been a pleasure to work for you and with you and I hope I can continue to serve in the retirement phase,” he said. • became the state’s second largest university.